dcTalk is one of the most influential groups to ever come out of the Christian Music world. With 7 million albums sold including the double platinum album, Jesus Freak, multiple Grammy and GMA Dove Awards, dcTalk now have the chance to get the definitive collection of their biggest songs. This CD includes 18 groundbreaking songs, and if that is not enough, the Special Edition includes a DVD with 11 of the group's most recognized music videos including; 'Jesus Freak', 'Between You and Me', 'Luv is a Verb', 'Jesus is Just Alright' and more. All 3 members are still actively recording and touring. Their work away from dc Talk has been critically acclaimed with tobyMac recently receiving Gold certification on each of his two solo projects (500,000 copies each). 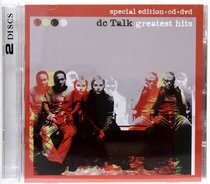 About "Greatest Hits: Dc Talk Special Edition CD & DVD"